When most people think of Hong Kong the images that are conjured up are of towering skyscrapers, junks and ferry boats crossing Victoria harbour and steaming bowls of noodles slurped down with bubble tea in busy street cafes. Inherent to this vision is the hustle and bustle of Hong Kong life – the teeming night markets of Mong Kok in Kowloon, the frenetic rabbit warren of Wan Chai’s streets and the thrumming outdoor escalators of the mid-levels of Hong Kong island. As a Special Administrative Region (SAR) of China for the past twenty one years, Hong Kong’s nearly 9 million local population regularly swells with growing numbers of both domestic Chinese and foreign tourists, visiting the numerous tourist hotspots, temples and shopping centres. As a result Hong Kong is ranked as the world’s fourth most densely populated region on earth. It comes as a surprise then to visitors and residents alike that Hong Kong possesses an abundance of natural space – all easily, and affordably, accessible – via its hugely efficient subsidised public transport system. 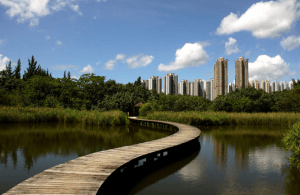 With 48 country parks in Hong Kong’s jurisdiction, numerous beaches and a series of hiking trails stretching over 40 kilometres, outdoor excursions are easy to find just thirty minutes or more from Hong Kong’s Central station. 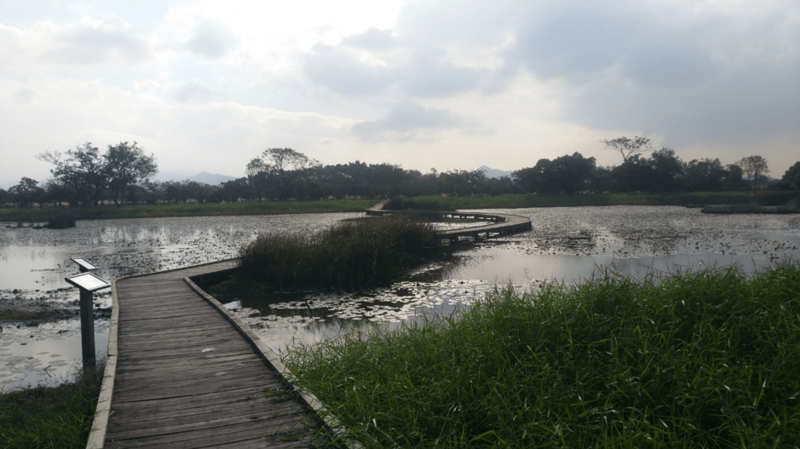 Amongst these treasures are an unexpected delight; a number of wetlands hosting some of Hong Kong’s most elusive animal life, including black-faced spoonbills, cormorants, fiddler crabs and mudskippers. As part of my work on the WetlandLIFE project (www.wetlandlife.com) on behalf of School of Environment and Technology, I was fortunate enough to be invited to join the team of Dr Xianji Wen at the World Wildlife Funds’ Mai Po Nature Reserve wetlands in the far north of Hong Kong, close to the Chinese mainland and its megacity of Shenzen. This reserve is not open to the general public, as access is restricted to protect the animal and plant life; though 150 permits are authorised daily to enable interested visitors to come to this very special place. After alighting the MTR in Yuan Long in Hong Kong’s New Territories at its northern edge, I spent a good twenty minutes trying to flag a taxi. I soon realised that in this area foreign visitors are not so common and that rather than stopping and being unable to help, Chinese courtesy meant drivers would rather avoid causing offense by driving past hoping that someone with better English would be able to stop. Little did they know that my wonderful host Dr Wen had printed all my directions out in both English and Cantonese. In the end I waved my printed instructions at every passing green taxi and a kind hearted driver eventually stopped. Off we drove, and on the twenty minute car ride the residential tower blocks of thirty floors and more gave way to lower-rise buildings and industrial units housing car mechanics and small factories. It seemed an odd location for a Nature Reserve, but as we rounded a long bend the scrubby bushes which populated the forecourts began to be replaced with larger trees, green swales and, at last, a familiar sight, the swaying of bulrushes – indicating the beginning of the wetlands. 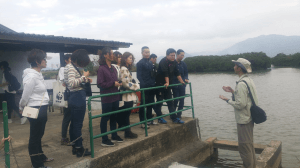 Quickly the units gave way to rectangular ponds – the original ‘Gei Wai’ shrimp farms that this part of the province relied on economically, providing produce for the restaurants of central Hong Kong at a commercial scale. The industry had become uneconomic by the late 1960s with only a few farms active by the time the British government claimed the space as protected countryside in the mid 1970s. 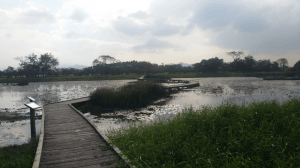 The site started operating as a nature reserve under the management of the World Wildlife Fund in 1983 with the site being designated international RAMSAR status in 1995. As well as the Gai Weis, the reserve has mangroves, inter-tidal zones and wide expanses of mudflats, thanks to the siltation process from being part of the Pearl River estuary which connects Mai Po with the Inner Deep Bay. This means that the terrain is varied in the park, including fixed walkways, hides for watching not just some of the 60,000 birds that overwinter from Siberia but also floating pontoons which rise and fall through the mangrove forests in response to the tide. In all the different wetlands I’ve had the privilege to visit around the world none have had this ingenious solution – a series of connected walkways floating on barrels. The threat of seeing my phone plop into the murk as I swayed and grasped onto the handrail means my photo shows a relatively benign sight – and not the lurching funfair attraction it became when I and my twenty Chinese companions started out on our epic trip around the mangroves. Luckily no one fell in! 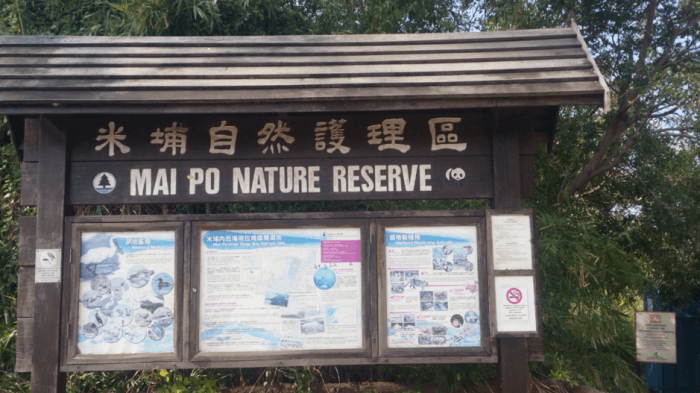 My site visit enabled me to see close hand not just the incredible animal and plant life, but the challenges of protecting this 7km square site which is hemmed in by the 13 million residents of Shenzen to the North, and only 5km away, and Hong Kong SAR to its south. Dr Wen and I discussed the incredible pressures the wetlands are under from climate change and the impacts of rapid urbanisation all around. It made me appreciate even more this amazing natural haven tucked within one of the most densely populated regions on earth.